If you’re planning on going on a road trip or travelling to another country, the solid toiletry bags can be a major convenience. They will neatly hold all of your toiletries, including toothbrush, toothpaste, shampoos, deodorant and other essential beauty products. And at the same time, they often come in a compact size and shape, saving you the hassle of packing them into your luggage. For long trips or even a weekend getaway, don’t get caught without a solid toiletry bag at your side. There are many factors to consider when getting a toiletry bag. First, examine how much space the bag has, and compare it to how much you’re expecting to carry. Even if you want to travel light, slim bags offer greater advantages than simply skipping it altogether. Otherwise, more expensive kits and bags deliver great value, with plenty of compartments to fit everything you might need. Make sure that the materials are durable. This can mean having waterproof fabric, but can also mean having a rugged frame to prevent the bag from collapsing in on itself and possibly damaging your products inside. Convenient features can include carrying handles, wide zipper fold-out panels, and having a tough enough frame to stand up on its own. Finally, style can be the most important feature, with many different aesthetics to choose from. 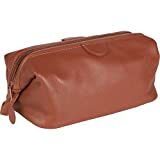 If you’re looking for a premium toiletry bag built specifically for men, check out this highly rated model from Pure Sir. 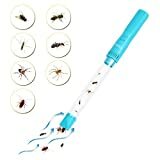 It measures 10.5 by 5 by 5 inches in size, and it is made from a highly durable PVC that is both smooth and long-lasting. The inner lining is waterproof, making it safe from any spills that might happen if gel caps pop off while you’re travelling. Both interior compartments are double zippered, meaning that you can fold in either compartment when it isn’t in use. This gives you more space to work within your luggage. It comes in a stylish all-black design. Coming in a moderately sized package with a smart balance between spacious design and compactness, this toiletry bag from AmeriLeather won’t disappoint. It is made from natural top grain leather. The simple access doctor bag-style compartment gives you full access to the entire bag. Meanwhile, the interior compartments are zipped to keep things neat, while two interior net pouches can strap in smaller products. It measures a modest 6.5 x 6.75 x 11.5 inches and comes in black, dark brown and tan brown styles. 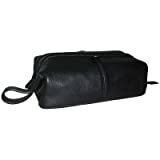 If you pack light while travelling and don’t need a large bag, check out this very inexpensive toiletry bag. It is designed to keep a modest amount of toiletries in one convenient place while you’re on the road. The bag even includes 3 TSA approved travel bottles. The durable polyester ensures that it won’t get roughed up along the way, while the versatile pouches allow you to use it as a makeup or medicine bag as well. It is fairly compact and won’t take up too much space in your luggage. For another cheap, yet effective travel bag, this cool baby blue model from Ohuhu is an excellent choice. The materials include a mix of 60% nylon, 20% dacron, 10% spandex and 10% PVC, all of which are waterproof. This complete mix of rugged materials ensures it is tough enough to survive your travels. It comes with a built-in hook, allowing you to store it easily, while the interior compartments offer multiple functions. While it is hanging, it gives you full access to all the products you need from inside. Made from super durable 600D nylon and pin-dot nylon material, this strong toiletry bag from Ogio is surprisingly affordable. It comes with a top carry handle for your convenience, as well as a side zippered compartment that is readily accessible. The swivel hook gives it a simple mounting feature, while the two interior pockets give it a ton of organized storage options. This bag is perfect for travel or even for taking to the gym. This compact toiletry bag from Kenneth Cole is reasonably priced and stylish. It is made from 95% vinyl and 5% nylon and is machine washable. The PVC exterior is rugged, and the top zip design for the main compartment is fully lined and convenient to access. The side handle gives you the simpler way of transporting and storing this bag as well. It measures 10″ x 4.125″ x 6.25″. It comes in a solid black finish with grey tabs. 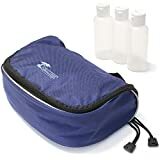 If you’re interested in picking up a whole bunch of travel toiletry bags for the whole family, few other brands offer the value that Conair does with this model. It comes with four zippered compartments, and the bag is easy to use and store things in. It measures 4.5 by 6.2 by 13 inches and weighs 1.3 lbs. You can either buy this model standalone, or purchase the 2 pack, 3 pack, or 6 pack if you need more. It comes in black and is guaranteed to help you get organized for your travels. With a unique design and authentic leather materials, this AmeriLeather bag exudes a certain amount of style and comes at a reasonable price-point. The leather used is a top grain cowhide, while the inner lining is waterproof. The interior zippered compartment has a lot of space for storage, while the easy access top style opening is great for accessibility. It opens wide and allows you to view all of the products inside at the same time, without having to adjust anything else. It comes in black and dark brown colours. If leather is your thing, check out this awesome deluxe toiletry bag from Royce Leather. Its defining feature is its traditional design and rugged materials. It uses a top grain cowhide leather that comes in either tan or black colours. The convenient interior pocket gives you the space to organize various products, while the waterproof lining ensures that there is no potential for damage. It measures 4 x 11 x 7 inches and weighs just 2 pounds. 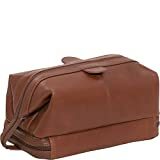 If you’re interested in a stylish and functional toiletry kit, pick up this model from Travelon. You can hang it up, and unzip it for full access to the four organized sections. The compartments are spacious enough to hold full-size bottles or even clothing. With 3 pouches in total, there is a lot of versatility packed in, and 2 of these pouches are removable. It can zip together to form a full-sized travel bag. 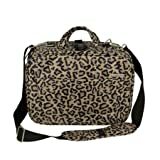 It comes in both full black and leopard print styles.